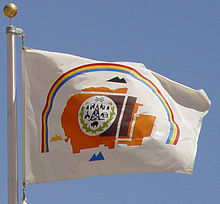 Large Rainbow compassing the Flag, four Mountains one White, Blue, Yellow and Black; Navajo Reservation outline in Copper Orange. The flag of the Navajo Nation is the official flag of the Navajo Nation, a Native American Governed Nation in the Four Corners states of Arizona, New Mexico, and Utah. On May 21, 1968, the flag was adopted for the Navajo Nation, a reservation in the Southwestern United States. This flag was designed by Jay R. Degroat, a student from Mariano Lake, New Mexico and was initially selected from 140 entries for the Navajo Flag Competition. It incorporates elements of the tribal seal designed by John Claw, Jr. adopted earlier, on 18 January 1952. A map of the Navajo Nation, with territories in three states, is featured prominently on the nation's flag. 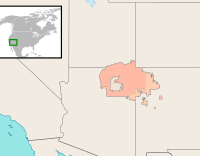 The Hopi Reservation is completely surrounded by the Navajo Nation. On a pale buff, tan, or copper field (sources differ), four sacred mountains of four different colors (black, white, turquoise, and yellow from the Navajo creation myth) surround the center element of the flag, a map of the Navajo Nation with a white disk in the center that features the Navajo tribal seal. The overall flag recalls sand painting, an art form used by the Navajos. A rainbow symbolizing Navajo sovereignty appears over the main design. In 1995 the Navajo flag became the first Native American tribal flag in space when Bernard Harris carried it aboard the space shuttle Discovery. ^ "Navajo Nation Government | Seal & Flag". dine.sanjuan.k12.ut.us. Retrieved May 21, 2015. ^ "Navajo Nation Government - Seal & Flag". ^ "Navajo Nation - History". Retrieved August 8, 2015.